Popbar, the maker of customizable popGelato, popSorbetto, and YogurtPops, founded in New York City in 2010, has officially opened in Costa Mesa, Californiaat the LAB, located at 2930 Bristol, Suite A 108. A Grand Opening celebration will be hosted by franchisees Jenn and Jeff King on Dec. 10 at 12 p.m. to mark the special occasion. Festivities will include pops on the house, served from the shop's eye-catching display, and prizes like the chance to win free Popbar for a year. Dedicated to serving 'the best' in frozen treats, Popbar serves handcrafted gelato, sorbetto, and yogurt in a new way – on a stick. All pops are made in-house daily with all natural ingredients. On the menu, you'll find 40+ rotating flavors ranging from classics (Chocolate, Vanilla) to the more unique (Green Tea, Passion Fruit) and even seasonal ones too (Watermelon, Pumpkin Pie). You can enjoy your pop as-is, or customize to your liking. Premium dippings and toppings include dark, milk, and white chocolate, nuts, sprinkles, waffle cone, caramel corn, and more. At Popbar, a mouthwatering experience awaits everyone, even those looking for vegan, dairy-free, gluten-free, and soy-free options. All popSorbettos are vegan-dairy-gluten-soy-free, and all popGelatos and YogurtPops are gluten-soy free. Other indulgences include Hot Chocolate on a Stick, Frozen Hot Chocolate, and the Double Shake, which is Popbar's take on a milkshake, made with any two gelato or sorbetto pops – YUM. All of this decadence can be attributed to Italian roots and a love for supremely delicious treats. Blending authenticity, innovation, and high quality ingredients, Popbar became a recipe for success, and the contemporary concept has been changing the way we enjoy our favorite Italian desserts since - on an international scale. Popbar currently has 10 stores in the US in states like NY, CA, and FL, and 16 stores internationally in countries like Canada, Russia, Japan, Korea, and Indonesia, but this is just the beginning. There are currently 5 stores under construction in new territories, and many more to come. Costa Mesa is the 14th Popbar to open this year and is located in the LAB - a goggle factory turned hip, indoor-outdoor hang out that is home to a variety of small businesses. "Ever since stumbling on their West Village location in NYC years ago, I knew the OC needed Popbar. We brought them to the Anaheim Packing House where they are rockstars, then realized that wasn't quite close enough to home," the LAB's co-creator Shaheen Sadeghi said. "So happy to say they are now opening at the LAB, a great fit into our "Little American Business" experimental retail campus." 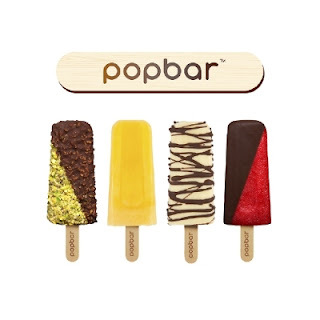 While Popbar is expanding rapidly, the brand maintains a 'mom and pop' feel at all locations with the help of its hand-selected franchisees. Each store prides itself on Popbar's original values - superior quality, in-house production, outstanding service, authenticity, and community. New stores quickly become classic neighborhood spots, and supplies like fruit and milk are purchased locally. Linda Sadeghi, also a co-creator of the LAB, said, "What's a girl not to like about Popbar? The pops are made fresh daily from natural ingredients and have a high source of protein. Most importantly, it's difficult to eat more than 100 calories in one artful serving although it feels like 1000." Popbar is a perfect treat for anyone - baby to adult, and for any occasion - dessert date to post-game celebratory treat to midnight snack. With so many flavors and combinations to try, just one visit won't do. You'll definitely want to stop in for a "love at first bite" experience, but if you're a foodie, don't forget to snap a picture of your pop first – that is, if you can wait. To keep up with everything Popbar, follow the brand on Instagram @popbar and Facebook @popbarUSA, or visit pop-bar.com. New territories are available for franchising. For more information, email franchising@pop-bar.com.